pine cones, seed pods, red berries, etc. The Advent wreath is an old German tradition that has gained much popularity in the last few years. Most Christian homes and communities practice this custom during the Advent season. This sacramental is rich in meaning, is easy to implement and can either be simple, costing little, or very elaborate, costing more, handmade or storebought, with fresh greenery, or permanent greens. The Advent wreath is a wreath, or circle, of evergreens, made in various sizes. It is either suspended from the ceiling by ribbons (preferably purple) or placed on a table. The devotion is usually incorporated during the family meal, or during family night prayers. Fastened to the wreath are four candles standing upright, at equal distances. These candles represent the four weeks of Advent. Three of the candles are purple, reminding us of the penitential nature of the season. A rose or pink candle is lit for the Third Sunday of Advent, also known as Gaudete (rejoice) Sunday. The name is taken from the entrance antiphon or Introit "Rejoice (gaudete) in the Lord always, again I say, rejoice." It is reminding us that the end of Advent is almost here, and we can hardly contain our joy. The wreath should be in a circle, a symbol of eternity, and a reminder that God has no beginning nor end. The evergreen is a symbol of eternal life and a reminder that God is immutable or unchangeable. The appearance of the actual Advent wreath is varied—everyone has their own interpretation of the Advent wreath. The look of your family's wreath depends on how much time and creativity you have to devote. Your family can create their own special wreath, or add personal touches to a store-bought wreath. With this devotion being so popular, one can go into any craft or garden store and buy a wreath. Any religious goods store carries several varieties, and the prices range from inexpensive to very costly. Some families want to create a new wreath every year, with everyone involved in the activity. Using evergreens, however, does add the risk of fire hazard, especially as the greens go dry. For less risk, or with smaller children or tight schedules, you may want to consider making a permanent wreath that you can reuse every Advent. There are five elements to the wreath: 1) Base, 2) candleholders, 3) greens, 4) candles and 5) ribbons and decoration. Your wreath can either be live or permanent. Below are several different ideas for each element, so you can create a wreath of your own. a) Spaghnum moss wreath form The form needs to be pre-soaked and full of moisture for the evergreen. This should be done overnight, excess water allowed to drip off. This pre-soaked form then needs to be wrapped with green florist wreath wrap. b) Oasis or some type of wet florist's foam shaped into a wreath form This foam usually comes in blocks, and you must find some round waterproof container to cut and shape your form in. If you do some searching, there are Oasis wreath forms available. c) Vine Wreath form You can put attach live or artificial greens to a vine wreath. The vine wreath can either be purchased, or handmade using vines from wisteria, grape arbor, cane or willow. Presoak or moisturize the vine ahead of time, because the vine must be pliable to be able to curl into a wreath. d) Styrofoam, straw, or some other type of wreath form At any craft store you can find a variety of wreath forms available in different materials. Styrofoam is the most readily available and the least expensive. There are also straw forms, either wrapped in plastic or wire bound to keep the straw from falling out. Any of these forms do not provide any moisture for the live evergreens. Unless you are using permanent greens, expect to either change the greens every so often, or have a very dead wreath by Christmas! e) Wire frame There are several types of ready-made wreath wire-forms you can purchase, or you could form your own out of strong wire, or even coat hangers. 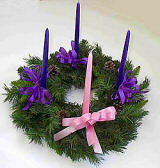 You could also purchase an actual Advent wreath form, consisting of a simple ring and candleholders. f) Ready-made Christmas Wreath You can purchase a ready-made Christmas wreath, either artificial or live. Usually the purpose of these wreaths is to hang on doors, so if you are suspending your wreath, make sure the underside is as attractive as the top. These are usually inexpensive plastic green holders, available at any craft or garden store or florist shop. If using foam or moss type form, these can be inserted directly into the form. Otherwise, these need to be securely fastened to the wreath with florist wire or hot glue. b) Spikes For the moss or foam forms, large nails or spikes can be inserted on the underside of the wreath so that the pointed side comes through the top, high enough to put your candles. The spike cannot be too wide, otherwise it will split and break your candle. If you use a large pillar candle, this option would be ideal. c) Wire Use heavy florist wire and twist around the bottom of the candles (about 2 inches), then fasten the ends to the form. This has to be very tight, with no movement for the candle. d) Other ideas There are such a large variety of candles and candle holders available in almost every store. There might be different types of attractive holders that could be attached to a wreath form. Just make sure you get something that will hold the candle and prevent the flame from coming too close to the evergreens. a) Live Evergreens For live evergreens, the choice is endless: yew, any type of pine, cedar, fir, laurel, holly, boxwood, spruce, hemlock, balsam twigs, even magnolia leaves can give an interesting look. Use what is available in your area, what is easy to manage, and what appeals to you. The way your greens are cut depends on what type of form. If you just have a wire frame, you need to have branches that you can wire together and attach by florist wire onto the frame. If using forms, like foam, you can have small twigs or leaves and attach them to florist pics and insert throughout, or if the branches or leaves are sturdy enough, insert them without pics. Check with your local craft store to see if there is a spray or preparation you can add to your leaves to make them non-flammable. b) Permanent or Artificial Greens There are a variety of types of artificial greens. You can buy prepared florist "pics" and insert them into your form. Or with smaller branches, attach each piece to the form with strong florist wire. Another option to consider, especially with smaller frames, like wire, is to purchase an artificial garland. Measure the garland around the form, and cut the garland just a little longer than the ring. Attach the garland around the wreath form with florist wire. Shape the branches around to hide the form. With the surging popularity of candles, this by far is the easiest item to find. Usually the candles are tall taper candles, 3 purple or violet and 1 pink. These can be found almost anywhere. If you plan on burning the candles everyday, it helps to have a few extra to replace the first and second weeks of Advent candles as they burn down. If you absolutely can't find these colors, use white or ivory candles and attach ribbons (don't let the flames come to close) to the candles—three with purple bows, one with a pink bow. Most candles are paraffin, which burn quickly and drip. If you can find them, beeswax candles burn cleanly and smell wonderful. As you continue this tradition through the years, just keep an eye out for bargains and sales on purple and pink candles. If you are incorporating a different type of candleholder that can accommodate other sizes of candles, look for pillar candles, or other shapes to use in the wreath. Keep in mind that although Advent is joyfully awaiting Christ's arrival, there still should be some element of penance. The wreath should not be elaborately decorated, to show the difference between the Advent Season and Christmas season. Pine cones, seed pods, red berries can be added to the greens. You could attach purple bows to the wreath, and suspend the wreath with Purple ribbons. But besides these type of decorations, the wreath should be kept simple to remind us of the penitential nature of Advent. For the Christmas season, the greens can be refreshed, the candles changed to white, red or gold and the ribbons changed to joyful Christmas colors. Other options: add some Christmas balls or other decorations inside the greens.